Winter is so beautiful that’s it’s really hard not to enjoy it…unless of course you are a kid who can’t get outdoors. If you have kids then you know how difficult it can be to keep them occupied indoors when it’s just too cold and snowy for them to go out. Luckily, there are crafts and I’ve found 30 fun winter crafts that are sure to keep your kids busy indoors when they can’t go out and play. From Christmas crafts and decorations to just general winter fun, these are guaranteed to put a smile on your little ones’ faces even if they can’t go out and build a snowman. 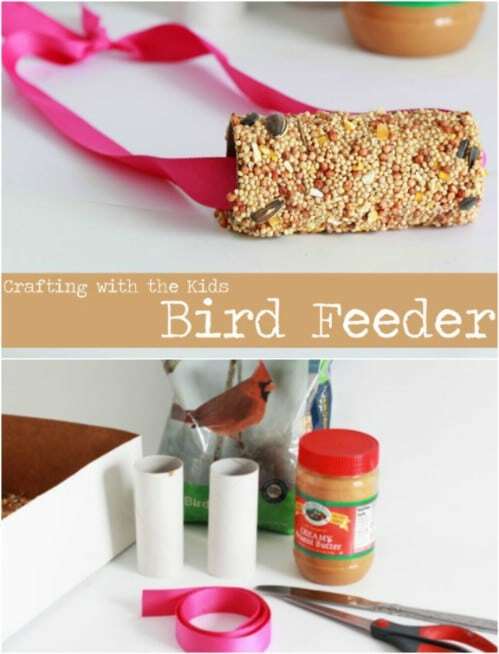 There are so many wonderful things for kids to do inside, from making bird feeders to creating their own melting ice experiment and they are sure to love each and every one of these crafts. There are ideas for kids of all ages so even if you have pre-teens or teenagers, they are bound to love at least one of these crafty projects. And, you should be sure to take a look at these 25 fun Thanksgiving crafts for kids, as well. My kids always loved playing in the snow but when the temperatures get really low, there’s just no way that I will let them outdoors. I’m so glad I’ve always had crafts on hand for them. I mean, there is always television but who wants their kids to be stuck in front of the TV or playing video games all day? Children need to foster their creative outlets and these crafts are just the things to let them do that. And, you really should check out these 35 projects to turn household items into magical things for your kids. They’re filled with wonder and amusement and will pair nicely with these fun winter day crafts. 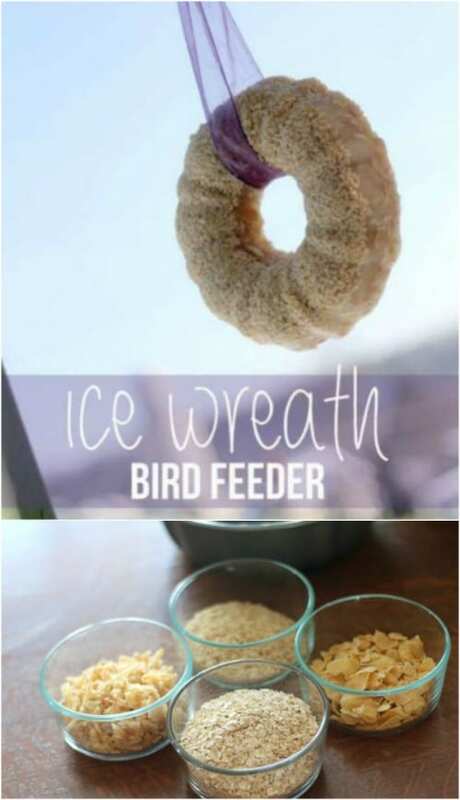 Kids are going to love making this frozen bird feeder. This is a great project for even your youngest and is really easy to do. You just fill a bundt pan with bird seed and then add water. Sit the pan outside in the cold and let it freeze – little ones will also love checking on it from time to time to see if it’s finished. Once it’s frozen, hang a ribbon through the hole and hang it on the porch. Here is another great bird feeder idea that has a more traditional spin. This one uses peanut butter to hold the bird seed to cardboard and kids for decades have adored making this one. You just spread peanut butter on cardboard and then add birdseed. Then hang it on the porch or deck or out in a tree in the yard with a nice ribbon or some twine. 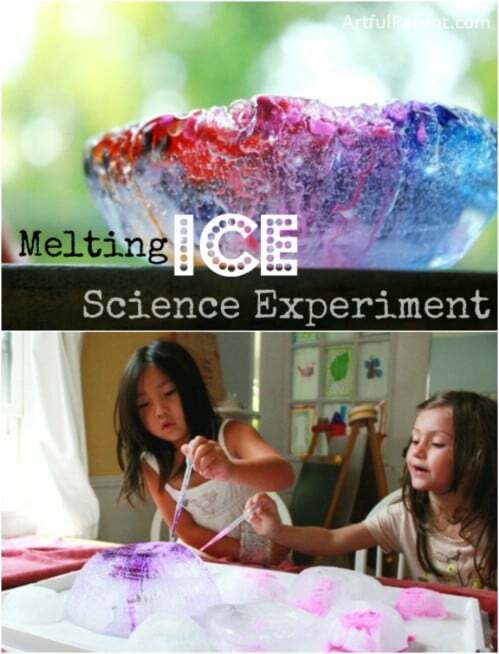 Kids love science experiments and this one is easy enough for them to do on their own. 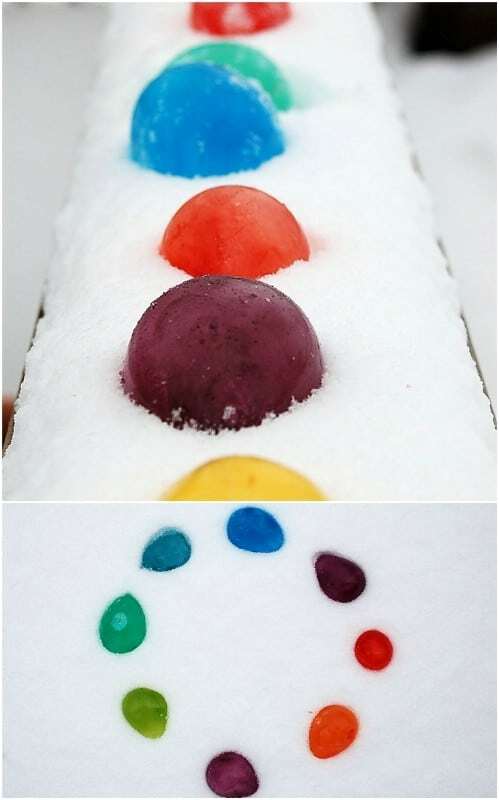 It involves melting ice with salt and then adding liquid watercolors to make an amazing end result. You’ll need salt, liquid watercolors or food coloring, a few bowls, and a spoon for this experiment and it is virtually guaranteed to thrill kids of all ages. I love repurposing projects and your kids are going to love this little penguin craft that you make from repurposed toilet paper rolls. 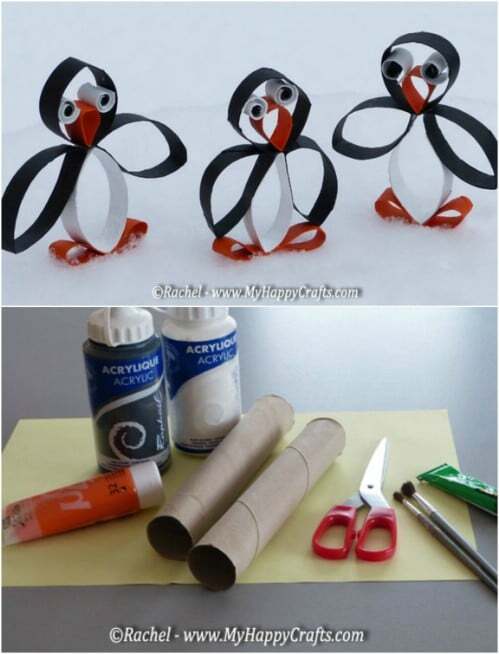 For younger children, you may want to do the cutting but they can easily assemble and them decorate their own little winter penguins. 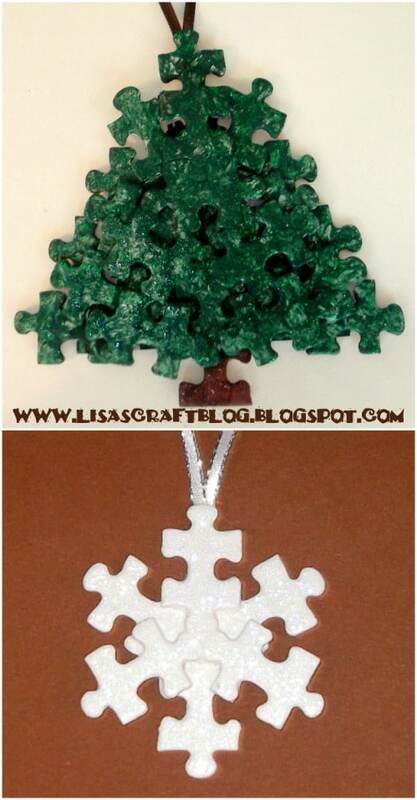 This is a great pre-Christmas craft. They can use their penguins as tree decorations or tie them all together with twine to make an adorable garland. 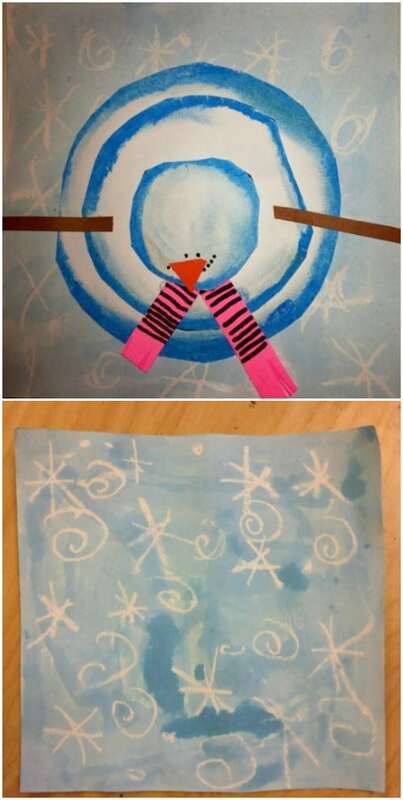 This winter collage is perfect for preschoolers and younger children. You help them to make a collage using their fingerprints. Kids love finger painting and this one will surely keep them from being bored on snowy days. 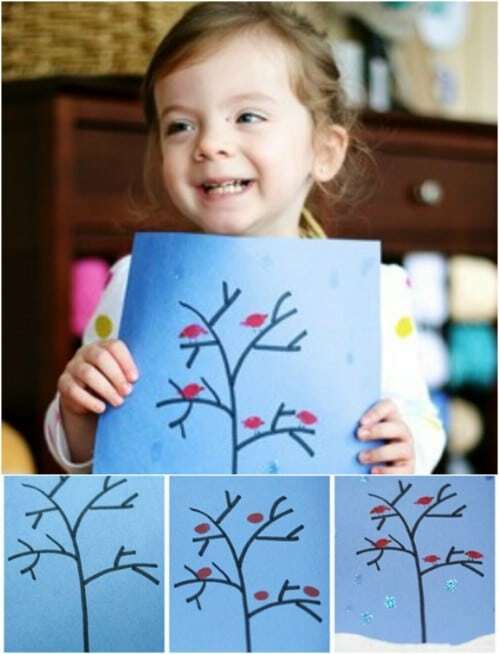 Draw a tree frame with a black marker and then let them use their fingers in red and white paints to create cardinals and snow. 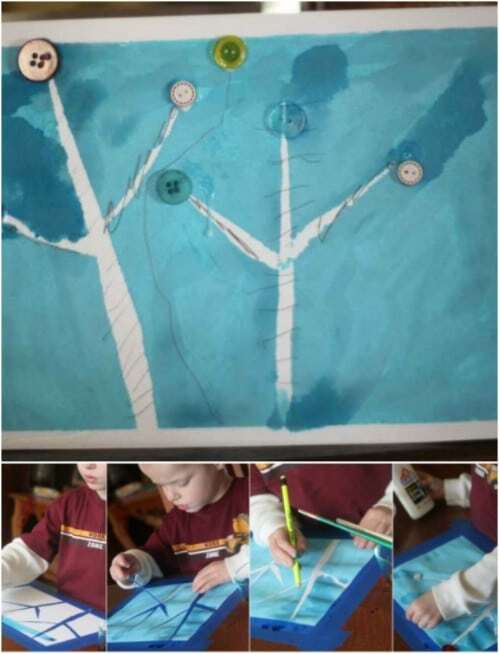 This birch tree art uses tape resist and kids are going to love the end result. Tape resist means that you tape the art to the table so that it creates a border and then tear tape into pieces to create trees. Kids then use watercolors to paint around their creation and then they tear off the tape to reveal their artwork. You can glue on buttons and other embellishments for leaves. Kids love polar bears – who doesn’t? – which makes this the perfect winter day craft. 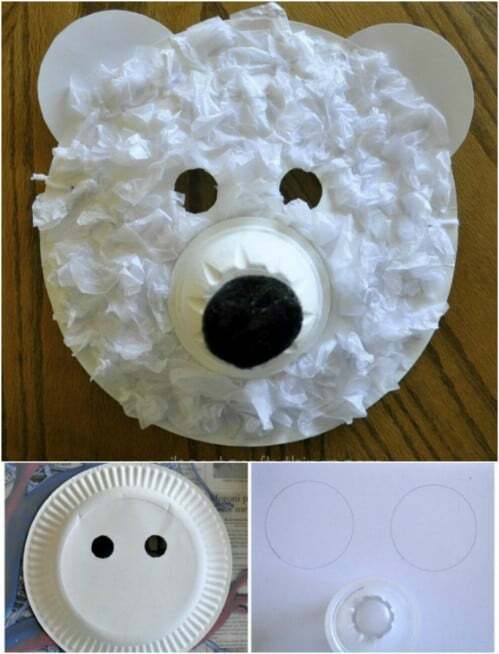 They create their own polar bear masks using paper plates and white tissue paper. the nose is made from a plastic fruit cup and a black pom pom. These are so cute when they are finished and once the crafting part is over, they can spend hours playing with their new masks. Mosaics are always good for keeping the kids busy for a couple of hours. They are going to love making this little igloo that they create on construction paper with blank label stickers – or you can use torn paper and glue if that’s what you have on hand. 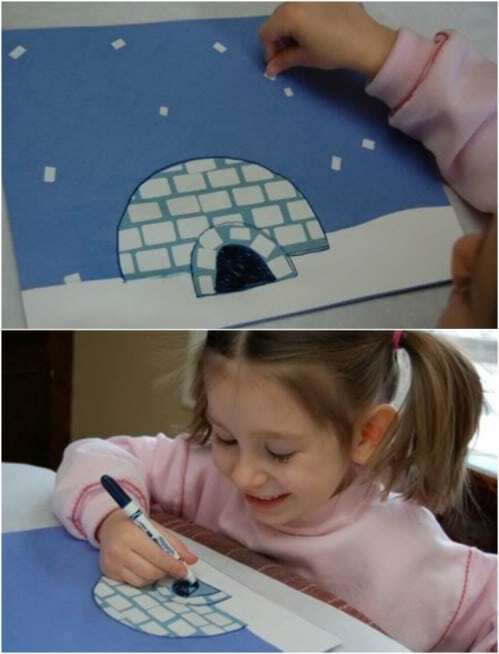 For younger children, help them to draw in the outline of the igloo and then they can fill in the mosaics on their own. Snow globes are so great. I have a nice little collection, some that my kids made when they were younger. Your little ones can get in on the snow globe fun, too with this easy craft. This one is a paper snow globe and the only help they should need is drawing and cutting out the shapes. Once that’s done, they can paint in a snowman or any other picture and surround it with painted snow. 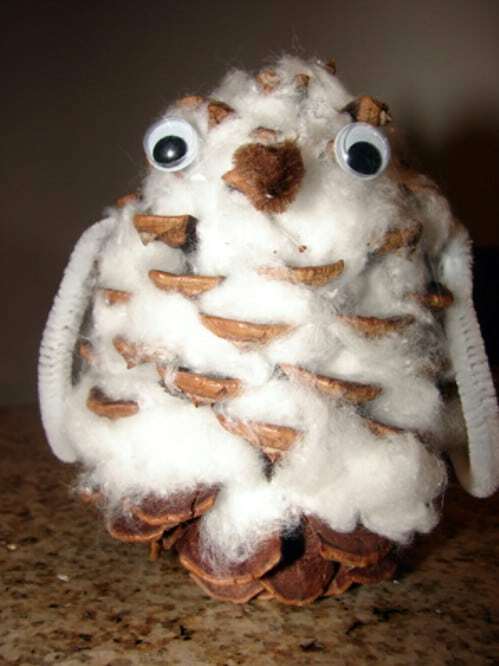 Pinecones make wonderful craft supplies, as do cotton balls. When you put the two together, you have the makings for this adorable little snowy owl that your little ones are going to love to craft. Kids can shred the cotton balls (they love this step) and then glue them onto the inside of the pinecone seeds. Add google eyes and a beak and they’ve got an adorable craft – and a good smelling one if you use cinnamon scented pinecones. Add this to your list of pinecone crafts for this season. 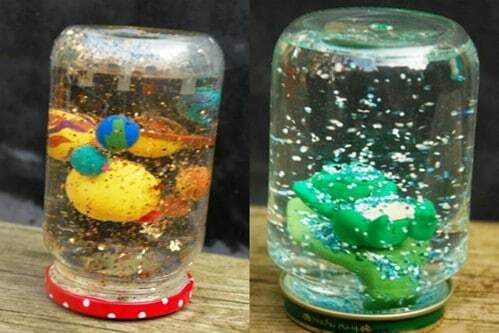 Kids really love making snow globes and they will adore these homemade snow globe jars. For supplies, you will need empty jars and lids – baby food jars work great for this. You’ll also need plastic figurines for each jar, glitter, water and glue. This is such a cute little craft and if you’re looking for something to do before Christmas, you can pick up plastic Christmas ornaments like Santa or snowmen for the figurines. Here is another cute little snow globe craft (It’s winter, so there should definitely be snow globes). This one is made from paper plates and it has a really nice three dimensional effect. You cut out the bottom of one paper plate and then glue it to another, filling in the middle with glitter, confetti and any other decorations that they want to add. Instead of wiping their handprints off your stainless steel appliances, have the kids turn those handprints into these adorable little penguins. These are made from foam paper and the handprints make the feet. They’re pretty simple to do, even for preschoolers. 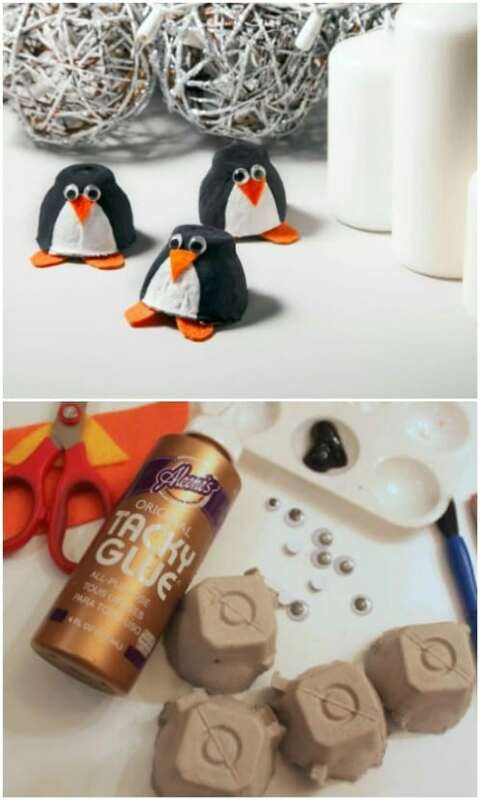 Just cut out the penguin shape and when they have added their handprint feet, they can decorate with google eyes, scrapbook paper and other embellishments. I love this snowflake craft for toddlers. 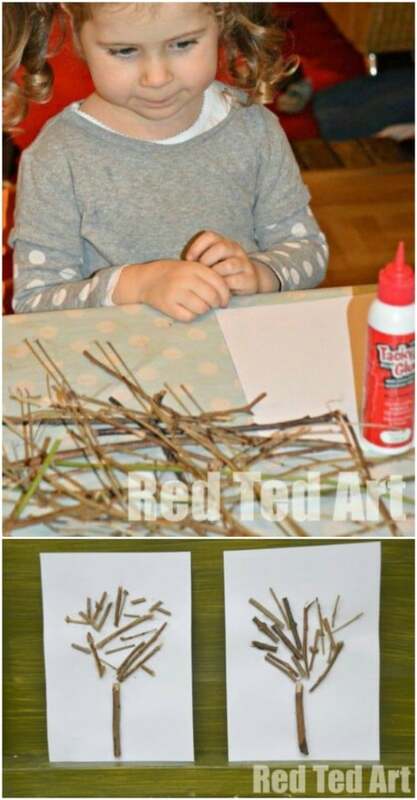 This is a great preschool craft idea or just something to keep the kids busy when it is actually snowing outside. You make this with cotton balls and it is so very easy. Just brush glue in the shape of a snowflake onto blue construction paper and then let them add the cotton ball snowflakes. For older kids, you could cut these out and even let them string a few together to make a nice holiday garland. Here’s another great craft project for younger children. These frosted winter pinecones are so easy to make and they are perfect for hanging on your Christmas tree for decorations. 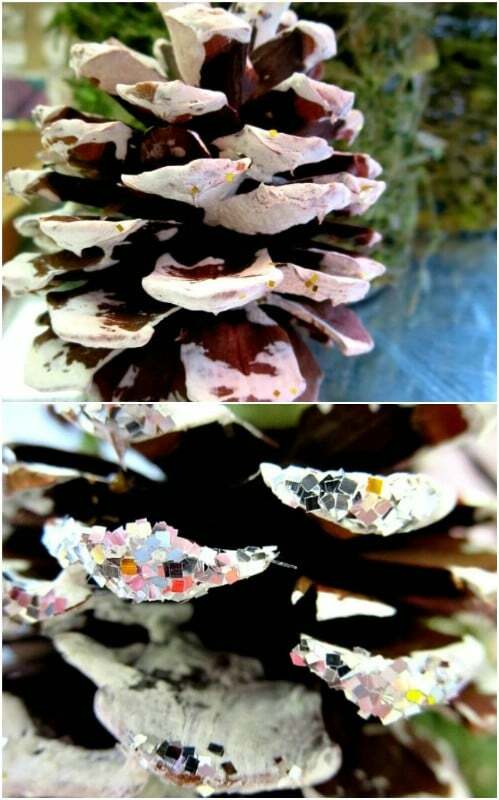 To make these, you simply have your little ones brush some white tempera paint onto the seeds of the pinecones and then add glitter. They will love the finished result and you will love how long this craft will keep them entertained. How about a great colored glass project for kids? They are really going to love this one – it uses water balloons and food coloring to create such a beautiful work of art. This one is a bit messy so make sure that they wear old clothes. You add food coloring to balloons and then fill with water and then let them dress warmly and place their colored balloons out in the yard for decoration. This one is great before Christmas – if you tend to get snow before the holidays, that is. This tissue paper snowflake is great if you love upcycled cereal box crafts. You just cut the snowflake out of cardboard and then let your little ones cover it in white tissue paper. These are really simple and they look so pretty when they are finished. They could tie a few of these together and make a snowflake garland for your Christmas decorating. 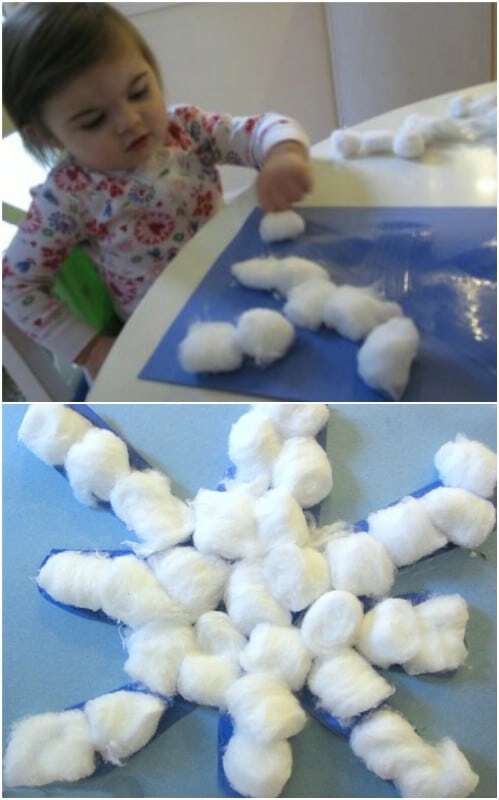 Here is another really easy snowflake craft that even your toddlers can do. 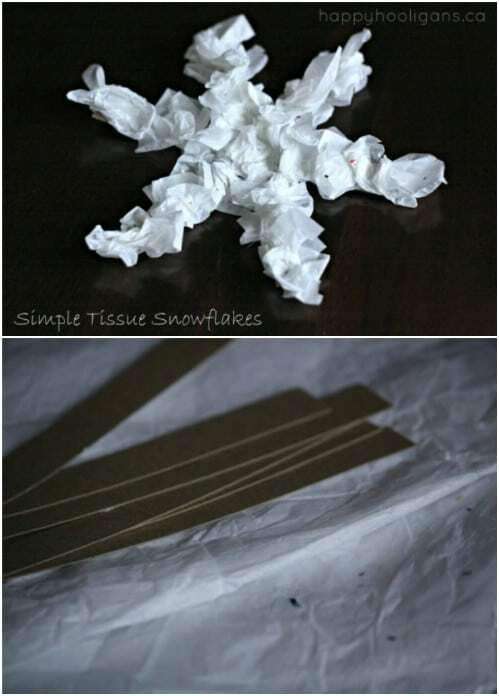 You need white tissue snowflakes for this one and you can make those yourself by just cutting a snowflake out of tissue paper. 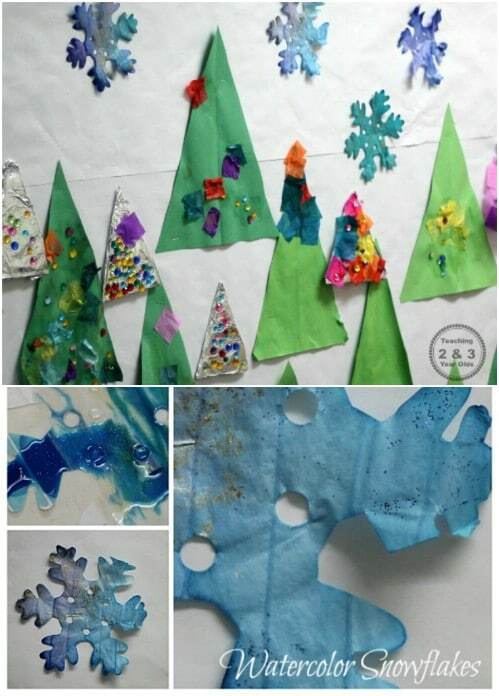 Then, let the kids use droppers to add color to the snowflakes – mix watercolors with a bit of water to thin the colors out and they will run together making really unique designs. 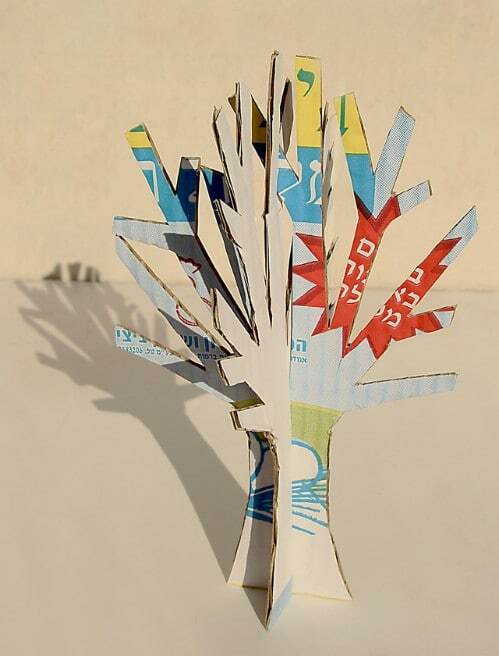 These winter trees can be made from upcycled cardboard and they are really easy to do. You just cut out two identical trees and then join them together to give them a great three dimensional effect by cutting a slit in the trunk of one and sliding the other into it. Kids can decorate these in any number of ways and then help you to put them together. Help your little ones to cut out these cute mittens and then decorate them. Mittens are a must for winter and these can be used for holiday decorations or you can just hang them on the fridge when they are finished. They can be decorated with strips of paper, stickers or anything else that they want to use. Cotton wool makes a wonderful trim and they could even trace their hands for this one and make regular gloves. 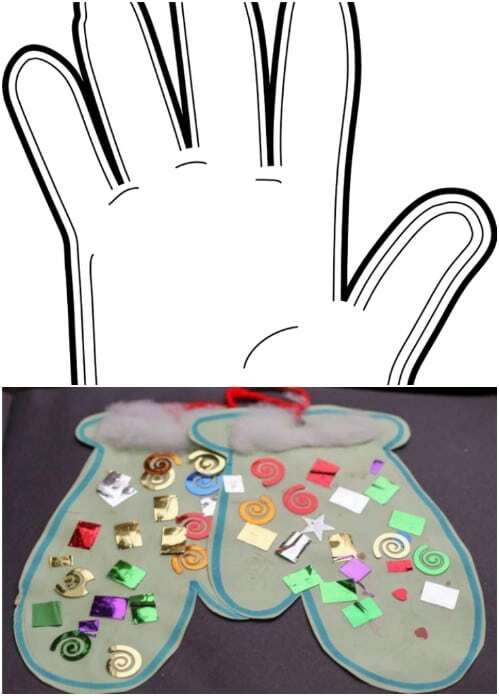 Help your little ones to trace their handprint onto construction paper or colored cardstock. Once you have the handprint, they can paint it white and decorate it to look like an adorable polar bear. These are really cute and so very easy. 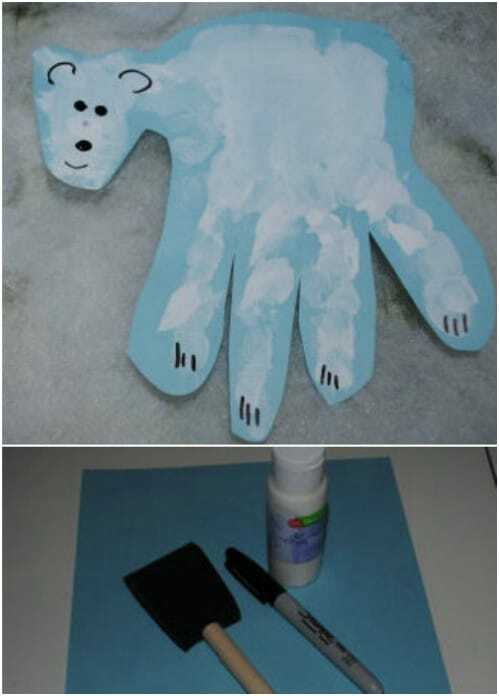 You can also just paint your child’s hand and then use the stamp method to create the polar bear. Then just add the features and cut out their little bear for hanging. Turn a wintry day into a fun crafty day when you help your little ones to make these adorable stained glass snowmen. You just cut out the snowman from clear contact paper and then use different colors of tissue paper to create the stained glass effect. These are really easy, even for toddlers as they can just glue the tissue paper in whatever design they want. 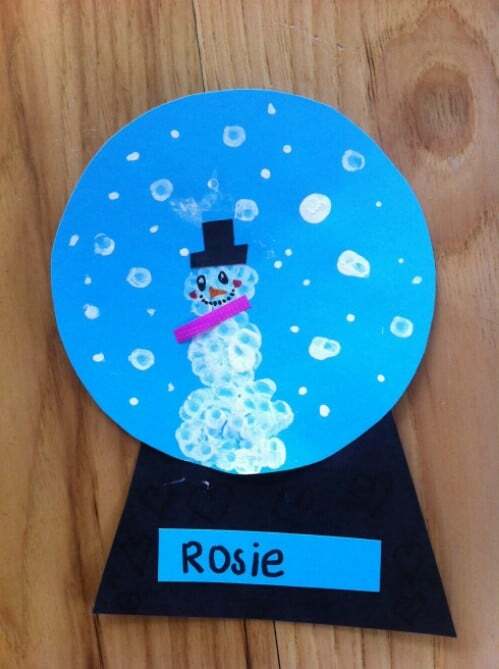 Kids do love snowman crafts in the winter! How adorable is this little snowman? It looks like an aerial view and it’s really easy to make so it is perfect for toddlers and preschoolers. You just help your little ones to cut out circles in three different sizes and then stack them to make the snowman. Then, they can add the face and buttons with paint or other embellishments. The head of this little snowman actually sticks up thanks to some upcycled cardboard. Kids will love making these ice ornaments. They are really easy and so creative! 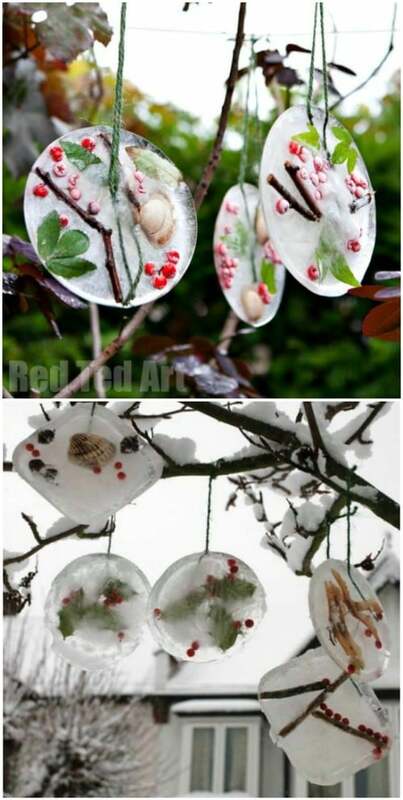 This craft also helps to teach younger children about how water freezes and hey can use just about anything that they want to decorate their ornaments like twigs, berries, leaves, seashells or even smaller ornaments. 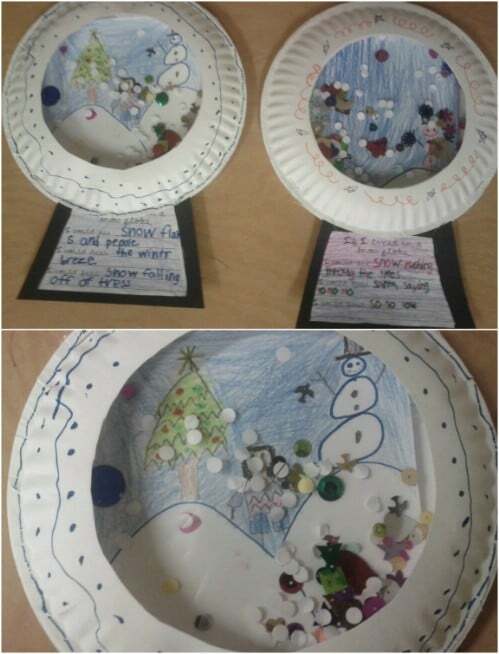 The ornaments are designed around a paper plate and you can hang them with twine or ribbon. If you have a cardboard egg carton, this is the perfect craft for upcycling it. These little penguins are so adorable and they’re pretty easy for little ones to make. You will need to separate the egg carton and each cup will make one penguin. Let the little ones paint the cups black and leave a space in the front to paint white. Then, just add google eyes and other decorations like felt feet and a felt beak. 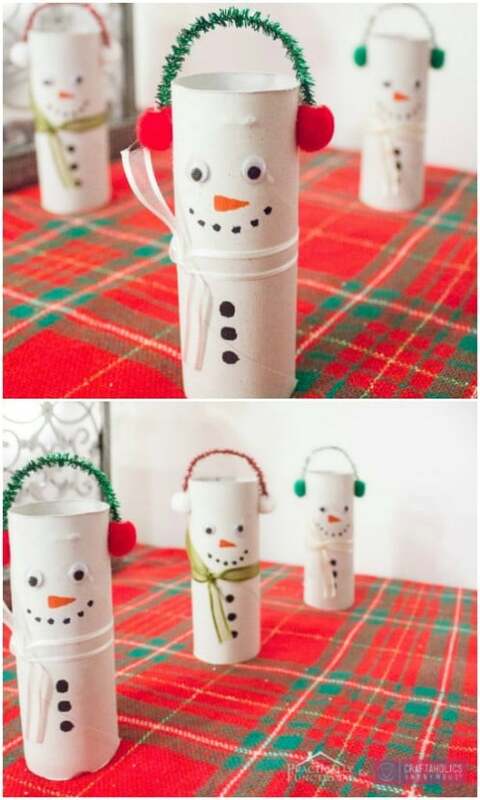 Years ago, my son made one of these toilet paper roll snowmen in school and I have loved them ever since. They’re so easy and they are made from upcycled toilet paper rolls so they’re also really economical and cheap. Just let them paint their rolls white and then add pipe cleaners and pom poms to make ear muffs and the face and buttons can be done with black markers. And, the pipe cleaners are perfect for hanging these on the Christmas tree. These paper roll crafts are so easy and so much fun! Kids love puppets and they will love making this one even more. Once it’s done, they can play with it for hours. 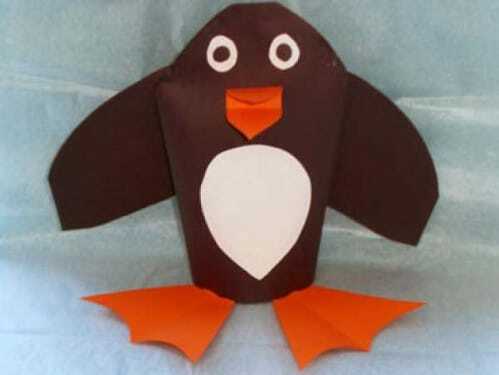 This little penguin puppet is made out of construction paper and it really is easy to do. Just cut out the needed shapes and sizes (for younger children) and have them put their puppets together and glue on the details. If your kids have a few old puzzles that are missing several pieces, this is the perfect upcycling project. Paint those puzzle pieces white and then assemble them so that they look like a snowflake. You could also make a Christmas tree or any number of other things from them. You just layer them together until you have the shape that you want and then glue them and add a ribbon for hanging. If you really need something that will occupy the kids for a while, this four seasons craft is perfect. They create the four seasons with sticks, cardstock and other embellishments. Small sticks can be used to make their trees and then they just change the scenery for each of the four seasons. They will adore all of the gluing and painting that comes along with this one. These craft stick snowflakes are really colorful thanks to some glue and glitter and they are super easy to make, even for toddlers. 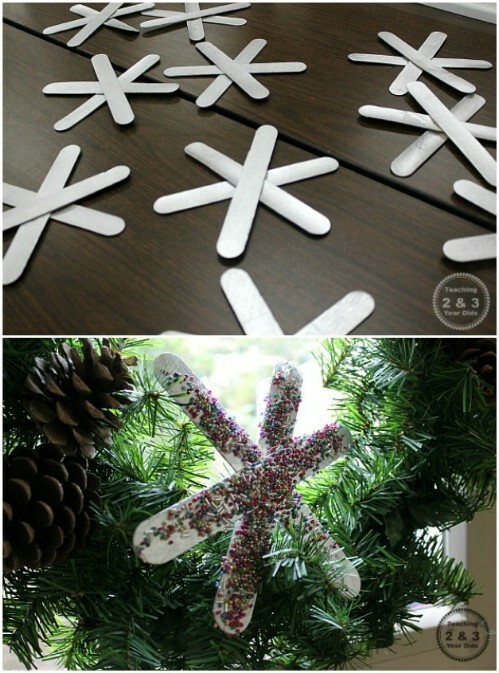 Just glue three sticks together to form a snowflake and then let your little ones paint them or add glue with glitter. They could also glue on buttons, sequins or any number of other embellishments to make them really unique. If you have a collection of popsicle sticks, this makes a great popsicle stick craft, too.